The Quantum of the Seas offers a groundbreaking cruise experience with superb technology and dining on board which will never disappoint. One of the main things that will catch your eye on the Quantum of the Seas is ‘North Star’, which is a capsule that ascends 300 feet above sea level to give you a magnificent view of the ocean and sets the standard for the rest of the design of the ship. 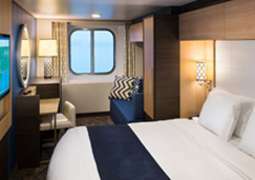 The cabins on board are welcoming for everyone, with 34 wheelchair accessible cabins, interconnecting family-friendly modular staterooms and inside cabins which have virtual balconies, bringing the views of the seas to everyone aboard. The Quantum of the Seas has got ‘SeaPlex’, the largest indoor sports and entertainment complex at sea, as well as ‘RipCord’ by iFly for those who like adventure. The ‘Dynamic Dining’ on board reimagines the way you eat on board so that you make the choices of where, when and what you eat. The ‘Two70’ venue hosts spectacular aerial shows at night with dazzling digital scenery, transforming seamlessly from the daytime open area which is perfect for relaxing while taking in breathtaking views. The Quantum of the Seas will always surprise you, as you are taken on a journey that won’t be forgotten. Quantum of the Seas was the first ship launched in the new Quantum Class of ships with Royal Caribbean, which guarantees to bring your on board experience to a whole new level. 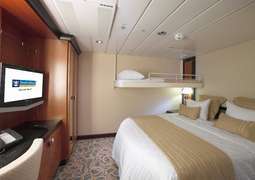 Thanks to the latest technology the Quantum of the Seas boasts a very high standard for their cabins and suites. 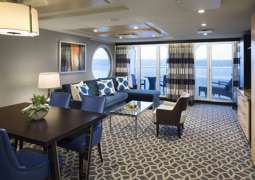 The Quantum of the Seas was the first ship to introduce Virtual Balconies at sea, a floor to ceiling screen that displays live views from the ship. There are a number of cabin categories available for you to choose from; for families there are interconnecting cabins, for luxury there are loft suites, studio cabins for solo travelers, and balcony cabins to take in the view. Additionally, the Suite life just got sweeter. 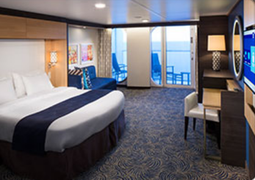 Suite guests will have three distinct tiers, the Star Class, Sky Class, or the Sea Class. On the Quantum of the Seas, Suite guests will experience a new form of luxury, with additional benefits, exclusive access to facilities, and your own Royal Genie, (yes, your wish is their command). With a number of dining options, and a variety of cultural cuisines on board, you'll never go hungry. Dining is redesigned on board this ship with multiple main restaurants, that are included in your cruise fair, to high class, luxury dining. You will be able to immerse yourself Chinese and Western dishes, or sample dishes from the Royal Caribbean favorites such as Windjammer and Sorrentos, there is also the first Royal Caribbean ice bar to cool off in. For children there is the award-winning Adventure Ocean program, special children daycare centers and a water park. Royal Caribbean is also the first cruise line that has childcare facilities and staff that are certified and able to accomodate children with Autism. On board the Anthem of the Seas, it is recommended during the day to wear sporty and more casual clothes. In the evening your attire should depend on the particular evening program that you have chosen. So when packing make sure you have neat, as well as formal wear in your luggage. For shore excursions, it is recommended to wear comfortable shoes. Traveling on the Quantum of the Seas all persons under the age of 18 are considered a minor. Also, young adults 18-21 years of age need a guardian.